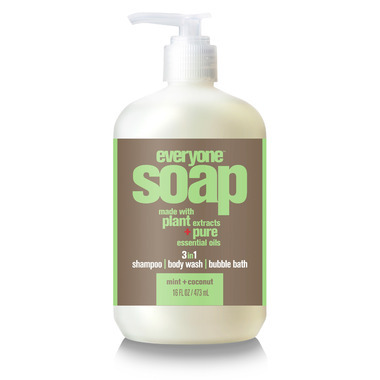 This multi-tasking soap is formulated to be used as shampoo, body wash and bubble bath. Blended with luxurious Coconut, cooling Spearmint and Peppermint essential oils refresh skin and the senses. Plant derived cleansers and botanical extracts create a skin-nourishing, foamy lather. Generously sized for the whole family in a recycled bottle. Organic Herbal Blend of Aloe, Calendula, Chamomile and White Tea extracts leave skin and hair touchably soft. Everyone in my house uses this. It gives off a nice fresh scent and does a great job.